Knox County Commissioner Michele Carringer (right) and her granddaughter, Emma Grace Wallen, congratulate Kristi Gifford, owner of the refurbished car. Knoxville’s giving spirit was on full display at lunch Wednesday as Kristi Gifford got a car. It was the second year for an interesting project – coordinated by Byrd’s Automotive at King Collision Repair and supported by numerous local vendors. Start with State Farm insurance. “We donated a hail-damaged (2012 Nissan Altima) that would otherwise have gone to the salvage yard,” said agent Sage Kohler. She was joined by Sheldon Green, Cindy Doyle, Mansour Hansan, Josh Hemphill, Petie Wilson, Deanna Coulter and Jennifer Downer from State Farm. Bill and Anita King with Cindy King McCoy at King’s Collision Repair, 2707 Old Callahan Drive at the intersection with Clinton Highway in Powell. 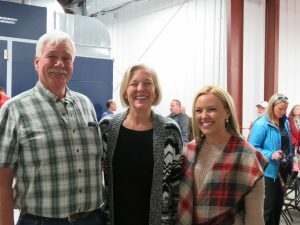 King Collision Repair owners Bill and Anita King hosted the lunch, assisted by their daughter, Cindy McCoy. King’s donated repair time and services for the vehicle. Jeff Mynatt, local manager of Byrd’s Automotive, was a key player. Byrd’s donated the paint and kicked in $500 for auto insurance through a program called Volunteer Rides. Affiliated with Knox Area Rescue Ministries and the Cerebral Palsy Center, Volunteer Rides supported three vehicle donations this year. In addition to King’s Collision Repair, Volunteer Rides donated through Foster’s Auto Body of Maryville and Courtesy Body Works of Knoxville. Service techs at King’s were all smiles, posing for a picture with the car before walking to the buffet for lunch.